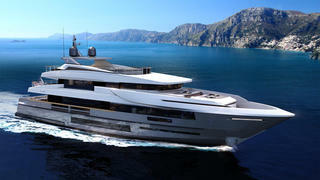 The Italian Sea Group has revealed its latest superyacht concept, a 40 metre aluminium yacht called the Admiral Vetta. Developed in collaboration with brokerage house IYC, the Admiral Vetta 40 features exterior design by naval architect Gianmarco Campanino. In a statement, IYC explained that the 37-40 metre bracket has proven particularly popular in recent times, adding that the Admiral Vetta 40 has been designed to meet this demand. Accommodation is for 10 guests in five cabins, including a master cabin with separate owner’s office as well as his and hers walk-in wardrobes. 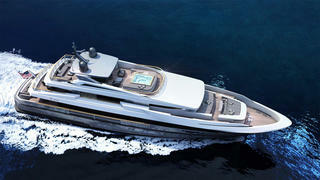 The crew quarters on the Admiral Vetta 40 allow for a staff of up to seven people. Other practical considerations include a spacious engine room and a separate crew staircase. The 8.4 metre beam allows for a total interior volume of 410GT, with a spacious main-deck saloon that incorporates full-height windows to allow plenty of natural light to flood into this highly sociable space. Exterior relaxation options are plentiful, with a cocktail bar and Jacuzzi on the superyacht sundeck and built-in seating and sunloungers on the foredeck. Owner’s can also choose to fit an outdoor cinema, while the aft beach club provides ample storage for tenders and water toys. Power would come from a pair of 1,450hp CAT C32 ACERT engines for a top speed of 16 knots and a cruising speed of 15 knots, while zero-speed stabilisers ensure a peaceful night’s sleep at anchor. IYC adds that the Admiral Vetta 40 can be built to LY3 standards within 22 months of contract signing, making a 2018 delivery possible.